While most pasta is a simple mix of eggs and flour, classic Italian gnocchi typically includes potatoes in the dough. Chef Pandel mixes up a housemade version at The Bristol and Balena, cooking the gnocchi to order and tossing it with heirloom tomatoes, pepperoncini, garlic and ricotta cheese. 1. Prepare gnocchi: Preheat oven to 350 F. Prick potatoes and place on baking sheet covered with salt. Bake in oven until tender. Let cool enough to handle. 2. Split potatoes and push through ricer; transfer into large bowl. Measure the weight of the mixture and adjust recipe as needed. 3. In another bowl, combine eggs yolks, butter and olive oil; mix well. Season potatoes with salt and nutmeg. Add wet ingredients and fold in lightly. 4. Add flour in stages only as needed to form a homogeneous dough. Form dough into 8-10 balls. 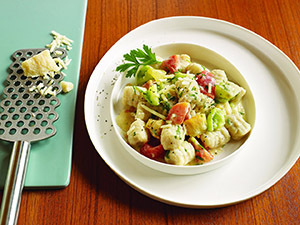 Roll out dough balls and cut into bite-sized gnocchi. Transfer to lightly floured half-sheet trays. Reserve, refrigerated. 5. In large saucepot over high heat, bring 1½ gallons salted water to boil. Drop in gnocchi; simmer 1 minute until they float to top. Drain, reserving ½ cup pasta cooking water. 6. Meanwhile, in large saute pan, heat olive oil. Add garlic; cook until light brown. Stir in pepperoncini. 7. Add poached gnocchi to pan, along with butter and pasta water. Cook over low heat until reduced by half. Toss in tomatoes and ricotta; cook just until ricotta coats pasta. Stir in parsley. To serve, garnish with black pepper and Parmesan.